To manage your user profile, click the User icon in the upper right corner of your screen. Click View Profile to edit your First/Last name, phone number, or change your email or password. Within the User Profile icon window, click User Management to add, edit, or replace users on your account. 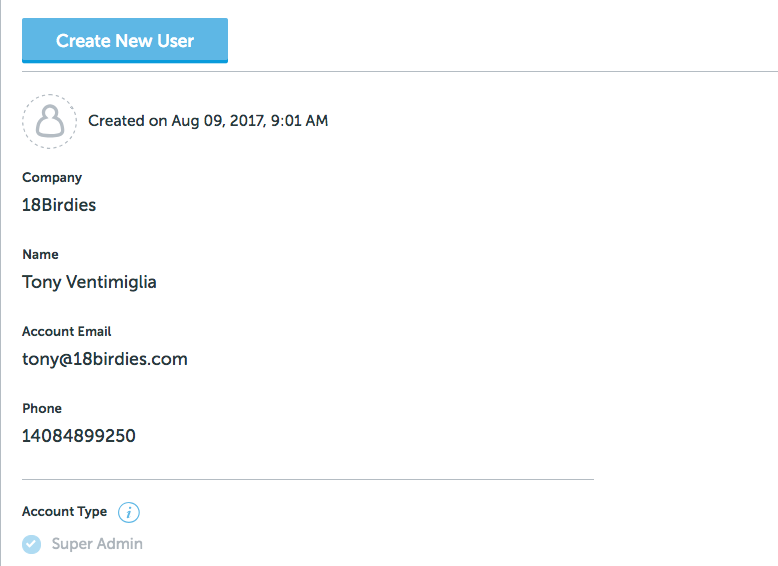 You will first see a summary of your user profile, Account Type, and Product Authorization. 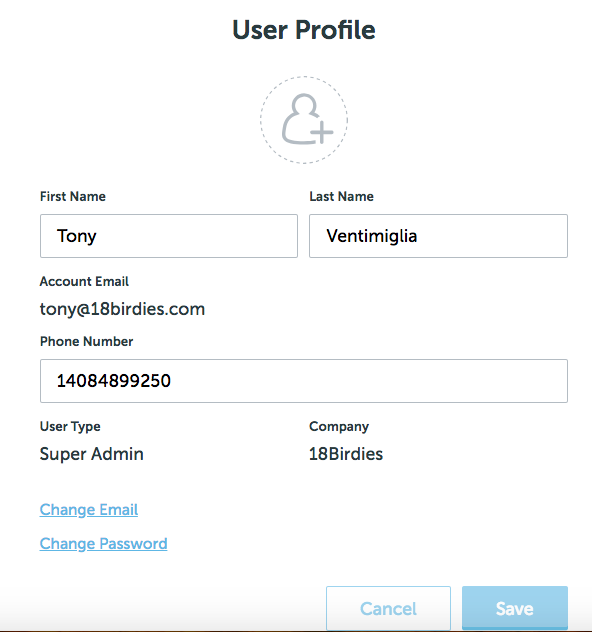 To create a new user, simply click the blue Create User link, fill out First/Last name, Email, and Phone Number, along with Account Type and Product Authorization. Super Admin: Master account Admin, has full access to 18B|B platform, including billing and payouts screens. Admin: User access, plus access new user creation and user management editing rights. 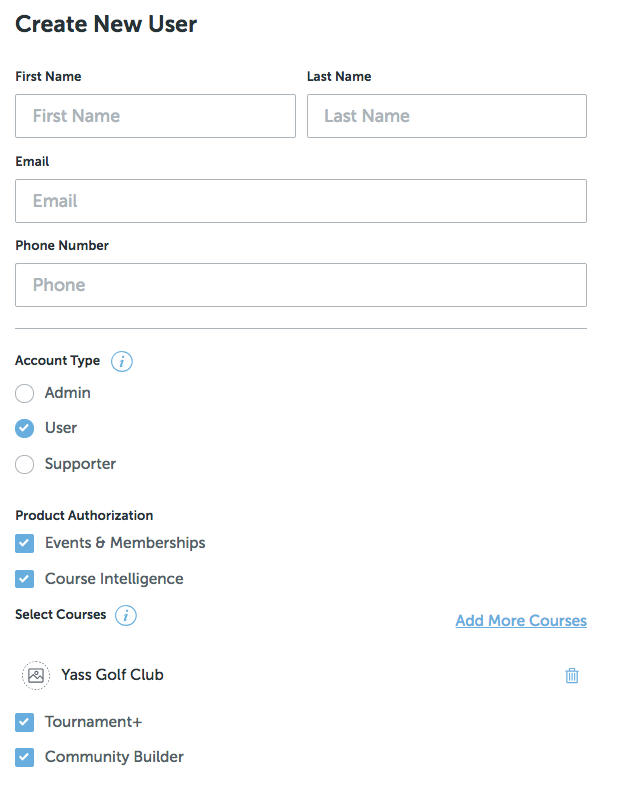 User: Supporter access plus Course Intelligence/Community Builder access and create/delete tournaments. Supporter: (Tournament+ only): Edit personal account details and manage tournaments. Choose the product(s) you would like to allow the new user you are creating to have access to by checking the blue check box next to the product name. For Course Intelligence, you'll want to also select which course(s) you would like to allow this user to access. As soon as you click Create, a verification email will be sent to the email address you entered so that the new user can confirm their account. Once they click the link in the email to confirm, they will be asked to create a password for their account and login. Once they do so, you should see their user profile appear in the column on the left side of your screen. From here, you have the option to filter the results of User Profiles displayed in the left hand column by clicking the drop down menu in the upper left corner of your screen. Click on a User Profile to manage it. You have the ability to edit First/Last name, phone number, Account Type, User Status, Product Authorization, and finally Delete the User.